2 Responses to Convention Update! 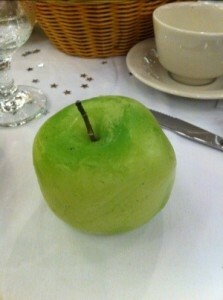 It is really nice to see that something has been added to The Wax Apple. It got off to a good start, back in 2006, and then after only a few months, it got frozen in time with nothing updated for five and a half years. The site has become as that bowl of wax fruit that Stan was eating in “Sons of the Desert”, just sitting there and never gettting replenished with new fruit. I hope that this new post, short as it is, means that the site will once again become an active one, where there will be new articles and updates. I’m sure that a lot of Laurel and Hardy buffs will enjoy looking through this site, once it comes back to life. Best wishes for the future. Happy New Year! Go ahead and post something! It will be delightful to see something new added to The Wax Apple, so that we can see that this is an alive and active website. Long live Laurel and Hardy on the web! Or is it on the “net”? Whatever! Let’s keep this thing going! The apple in the photo above looks like a Granny Smith, the kind on Apple Records, only that it isn’t cut in half, so we don’t know if it is on Side 1 or Side 2.